The bottom pond's full and already starting to go green. The top pond is drained and the liner punctured so the last few puddles of water can drain away. There are a few frogs and newts to re-locate and looks like I've managed to get atleast some of the frog spawn out of the way before filling it with water. That should have started this weekend, but I knocked my knee the other day and it flared up on Saturday - just at the wrong time. A friend moved the rolled up liner into position for us, and we should be able to get it in place over the next week. I've filled the bottom pond up to the brim and even bolstered the banks in one or two places to give me an extra few cm's of depth - that allows me to store some water in it for the top pond and should keep me on track for early May spawnings. Fertilising the ponds is also having to wait, but that can be done easily at night so will be possible to complete over the next week. The ducks have been back, and tried to get into the ponds several times. 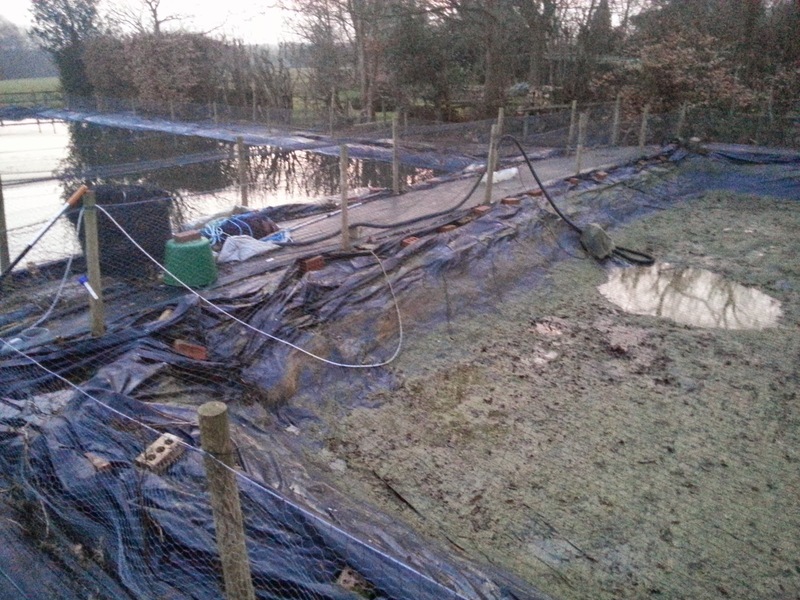 But the netting improvements we made last year are holding up and lets hope they continue to do so. In the polytunnel, the males pond is at 10C, and the females pond hit 12C today. It takes a sunny day to push the females tank up to 12C, and it would be great if we could have a few more sunny days to help keep the temperatures up. I talked about the problems heating the growing on ponds last time - to cut a long story short - I had more intermittent electrical faults through the week, and identified one faulty air pump which I thought was the full extent of the problems until I found another appliance that was tripping the power - only the beefy air source heat pump I bought last October! We called out an electrician to confirm the diagnosis and then a heat pump engineer to check the item over and identify which part of it was faulty. So here's where things got quite confusing. In the middle of the night, when I was root cause analysing the faulty equipment - the power kept tripping when the air source heat pump was turned on. the next day, our electrician re-performed the test and had the same result. But a few days later - the heat pump engineer visited and turned on the air source heat pump with no issues, and checked the device over and found each part worked ok. Neither the electician or heat pump engineer could find the root cause in the end, and I've had no electrical shorts for the last few days. that is great news ofcourse, but it leaves a mystery. In the course of corresponding with the electrician, heat pump engineer and the supplier - turns out we need to upgrade the wiring of the air source heat pump so it's directly wired into a breaker. We've got that work starting next week, and I've also bought another air source heat pump to plumb into the females tank - so we'll have that wired in with it's own breaker too. the new heater gives me a couple of options - initially, controlling the temperature in the females tank so I can give them stable temperature passage through to spawning time. Plus, a few extra weeks at warmer temps and richer food to help them prepare too. the other benefit is being able to heat the females tank through the autumn probably to the start of winter - which means it can double up as a growing on facility for the 10 or so tosai that I want to grow on to nissai. not ideal, but it will do the job and gives me a stop gap until I can get my head around putting another tank in. The females are bulking up nicely with eggs, and Amanda and I are already talking about which combinations we want to run. Both spawning combinations from last year were successfull, each for different reasons and I'd happily run both again. And there's the unknown discovery of what we could achieve with the other females too. Bottom line - I'll probably leave it right to the last minute, and as soon as there's a warm enough spell for spawning to take place, I'll check the females over and chose the one with the most developed egg load. After 2 or 3 weeks of low temps, and low feeding - the growing on tanks are back up to 24C and I've loaded up the auto feeders with the highest protein food we have and fingers crossed we can have 2 good months of growing on from now. the 'harry potter' tancho is still not right - but there is a noticeable improvement. initially, it's swimming changed from a two directional hinged swim movement, to a one direction hinged swim movement, and now it's back to a more balanced swimming action - half wave like, and half hinge like, but the motion is even on both sides. It's a promising development and I'll give it a bit more time to heal. I've booked a vat at the East of England koi show - this is one I've exhibited at a few times, but not for a few years and since then its won best koi show in the recent Koi Carp readers awards and it's one to look forward to for mid July. the texting system we've had set up in the polytunnel for around a year came into it's own during this period of intermittent power breaks - I get text messages each morning to tell me the power is on, and texts each time the power cuts. it means we've been able to react quickly each time the circuit trips and helps us manage the fish husbandry side of things during these issues. it's a basic burglur alarm with the power status / power cut texting feature - and something I'd recommend installing for piece of mind.